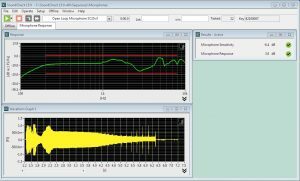 Open Loop Microphone Testing – Updated – Listen, Inc. This sequence demonstrates the two most common microphone measurements, frequency response and sensitivity, on a microphone embedded in a recording device. Typically when measuring a microphone the response of the device can be captured simultaneously with the stimulus. However, with devices such as voice recorders and wireless telephones forming a closed loop can be cumbersome or impossible. This sequence demonstrates how to measure such a device by recording the signal on the device under test, transferring that recording to the computer running SoundCheck and then using a Recall step to import the recorded waveform and analyze it. Note that this specific sequence, v3, is an improvement on the prior versions. The v1 release required that the audio file containing the recorded response waveform be manually windowed outside of SoundCheck before being analyzed. The v2 release utilized a new feature in SoundCheck 14, using values from the memory list to semi-automatically trim the waveform before analysis. This v3 release completely automates waveform editing.